Stress is common and there will be times when we all feel worried, anxious or uptight; but it becomes a problem when it takes the form of anxiety and stops you enjoying normal life. There are several signs to look out for to stop anxiety from taking hold. Stress is a natural and inevitable part of life. It is a normal emotion that is there to help us cope with difficult, challenging or dangerous situations. Stress is common and there will often be times when we all feel worried, anxious, or uptight. But it becomes a problem when it takes the form of anxiety and stops you from enjoying normal life by impacting upon your work, family relationships, friendships or social life. When does normal anxiety become a disorder? Anxiety has three main constituents: physical/physiological; emotional/psychological; and cognitive. There are a number of different anxiety disorders, all of which may share some symptoms but many of which will have specific characteristics unique to them. There are several key signs of symptoms that characterize anxiety and may indicate that you are suffering from a disorder. 1. Worry. Persistent or excessive, uncontrollable worry that lasts for six months or more is the most common indicator of an anxiety disorder. When people have this symptom, they are likely to worry too much of the time, more than other people would, and also struggle to stop themselves from worrying once they have started. People will find themselves worrying about the same sort of things that other people do but just more intensely and more frequently. This worry may become pervasive – that is, spread to other areas of their lives. People may report “racing thoughts” and “what if” thinking and there can be a tendency to ruminate or “over-think” scenarios such that the worry “spirals” out of control. The worry will be (objectively although not to the person) disproportionate to the event/situation and will be sufficiently intrusive that it has a debilitating effect on all aspects of the person's life. 2. Heightened arousal. When a potential threat is detected we go into fight, flight, or freeze mode. Our bodies release stress hormones (primarily adrenaline and cortisol) into the bloodstream which kick-start biological processes and responses to enable us avoid danger. These mean we are ready for action and can respond quickly as we feel more alert and energetic. There are a number of physical sensations which arise as a consequence of our body's natural "flight or fight" response to a challenge. "Butterflies" in the stomach or feeling nauseous. Once the event has passed, our bodies produce more hormones to enable us to relax, which can initially cause shaking as our muscles return to normal. Once the event has passed, so do the sensations and we return to normal. 3. Feeling restless or on edge. This is something people with anxiety commonly report and is often observed in agitated or fidgety behaviors. Someone may be unable to be still and may be observed pacing or wringing their hands, for example. 4. Panic. As part of anxiety, people may experience panic attacks – anxiety may reach a peak and the result is a panic attack. A panic attack is where the normal response to fear is exaggerated. It can be extremely distressing as when it happens for the first time people often don't understand what is happening: the physiological symptoms may mean people believe they are having a heart attack, stroke, or other catastrophic medical emergency. People may experience a feeling of dread or sense of “doom” which can lead to a feeling of panic and desire to escape. 5. Social Anxiety or phobia. Social anxiety disorder is used interchangeably with the term social phobia, although some argue that they are two distinct conditions. Social phobia concerns the fear of scrutiny and judgment while carrying out a task in public, whereas social anxiety refers to intense feelings of nervousness and overwhelming self-consciousness experienced in one-to-one and group situations. It is not unusual to be apprehensive or nervous on occasion in regards to social situations, but someone with social anxiety has a heightened sense of fear before during and after such situations. The sufferer will typically be fearful of embarrassment, or fear negative evaluation by others; they may tolerate social situations but in a state of extreme discomfort or they may avoid situations altogether. 6. Specific phobias or irrational fears. When a specific fear becomes so exaggerated, overwhelming and disruptive of everyday life, this is indicative of a problem. Specific phobias or irrational fears can induce such powerful feelings that they impair people's judgment and shape their way of life. 7. Sleep difficulties and fatigue. 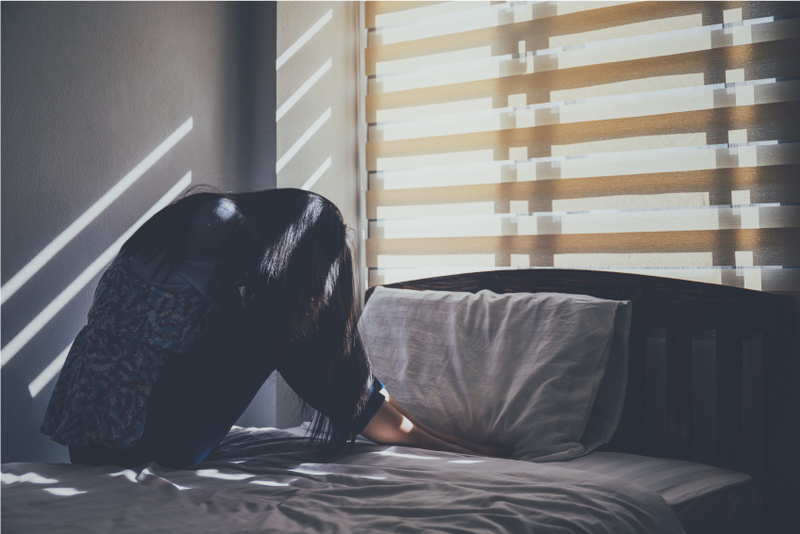 Those with an anxiety may often experience difficulties getting to sleep, staying asleep or early wakening. They may also report extreme fatigue which may be due to poor quality of sleep or result from being in a perpetual state of arousal with all its physical manifestations. It may also result from the excessive production of the stress hormones themselves, such as cortisol. 8. Irritability. Excessive irritability is a common feature of many mental health disorders and especially anxiety. Anxious thinking often leads people to feel they need to react quickly to make the feeling go away. However in the absence of a measured way of releasing this anxiety, it often comes out as irritability. 9. Concentration difficulties. When a person is preoccupied with worries, feels tense, nervous or self-conscious, or panicky, concentrating is extremely difficult. Negative thoughts and feelings cause extreme distraction which can manifest itself as poor concentration. 10. Feeling dissociated. Dissociation is one way in which the body and mind cope with overwhelming stress. Dissociation leads to a feeling of being detached or disconnected or things feeling "unreal". This is something most commonly experienced in PTSD or other traumatic stress responses, although it can also be experienced in other anxiety disorders such as panic disorder. 11. Avoidant behavior. Human beings are pleasure-seeking and pain-avoiding and so we will all try to avoid unpleasant tasks at some point. However with some anxiety disorders, people are compelled to habitually engage in avoidant behavior. For example, someone with a fear of flying might take an alternative (and much more time-consuming or costly) route to avoid having to fly. 12. Nervous “self-harming” habits or behaviors. Often those with chronic anxiety can be observed picking their skin, chewing their hair or other item, or biting or picking nails. These behaviors noticeably increase when under stress. 13. Perfectionism. The drive for perfection frequently masks an underlying fear of being deemed inadequate, being judged, or failure. Perfectionism is a common feature of both social anxiety and obsessive compulsive disorder. 14. Obsessive thoughts. Recurrent irrational thoughts or intrusive thoughts are often accompanied by compulsive behaviors (such as routines and rituals) which are performed in order to feel in control and lower anxiety levels. Obsessive thoughts (and associated ritualistic behaviors) are extremely distressing and have a significant impact upon everyday life.